Firebox Cloud brings the proven features and services of the Firebox to the Amazon Web Services (AWS) cloud computing platform. Firebox Cloud uses the same powerful Fireware OS and most of the same subscription services available on other Firebox models. You can use Firebox Cloud to protect servers deployed on your AWS virtual private cloud, and you can use it as a secure VPN endpoint for connections to resources on your virtual network. For greater visibility into the status of traffic and security on your virtual network, you can use WatchGuard Dimension to monitor Firebox Cloud. In the AWS Marketplace, you can purchase Firebox Cloud with two different license options. With this license option, Amazon charges you for the EC2 instance. You then purchase a license for Firebox Cloud separately from an authorized WatchGuard reseller. In your account on the WatchGuard website, you activate the Firebox serial number and specify the AWS instance ID, which enables you to get a feature key. You then apply the feature key to your Firebox Cloud instance, which enables you to configure all the licensed features. This feature key has an expiration date. You can purchase a renewal from an authorized WatchGuard reseller. You can purchase a Firebox Cloud for one of five models. The models are based on the maximum number of AWS vCPUs that Firebox Cloud uses. If you deploy Firebox Cloud on a VPC that has more vCPUs than the Firebox Cloud model supports, Firebox Cloud uses only the supported number of vCPUs. With this license option, the cost of the license for Fireware Cloud and all security services is included in the price charged by Amazon. Amazon bundles the price of your Firebox Cloud usage with other costs for the VPC. This provides a perpetual license with no fixed expiration date. There is no need to purchase, activate, or renew a separate feature key from WatchGuard. For either licensing option, the available security features and deployment steps are the same. For the Bring Your Own License licensing model, you activate your license and apply the feature key after you deploy your instance of Firebox Cloud. Amazon Web Services (AWS) is a flexible, on-demand, cloud services platform that provides compute power, database storage, and services at a variable cost based on the resources you use. If you are new to AWS, you must understand the AWS terms and concepts in this section before you deploy Firebox Cloud. An Amazon VPC is a logically isolated private virtual network environment in the AWS cloud. Firebox Cloud, and the virtual servers it protects, are all virtual machines that you deploy in a VPC. Amazon EC2 is a virtual server hosting service that provides scalable computing capacity in the AWS cloud, Amazon Machine Image (.AMI). An .AMI is a virtual machine template that you use to deploy a virtual server in AWS. Firebox Cloud is delivered as an .AMI file that you use to deploy Firebox Cloud in your AWS VPC. To launch one or more EC2 instances, you use an .AMI file. Each instance is a copy of the .AMI that runs as a virtual server. When you launch a new instance, you select the instance type, which determines the amount of CPU, storage, and network capabilities assigned to the instance. 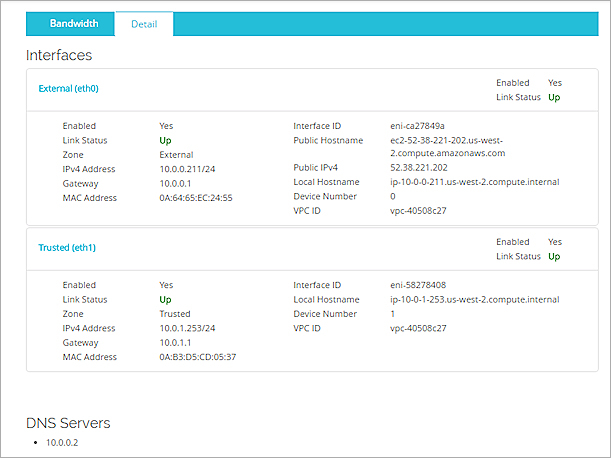 Firebox Cloud runs as an EC2 instance in your Amazon VPC. Each instance has a unique Instance ID. An Elastic IP address is a static public IP address that you can assign to an EC2 instance. First, you allocate an Elastic IP address to a VPC, and then you associate it with an EC2 instance in the VPC. For Firebox Cloud, you allocate an Elastic IP address for the external interface. The security group is a virtual firewall that controls which inbound and outbound traffic is allowed to reach the associated instances. In the security group, you define rules that control what traffic to allow. When you launch an instance, you must specify at least one security group. AWS has ten AWS Regions, which are in ten different regions around the world. Each region contains several Availability Zones. A VPC can contain subnets in different Availability Zones. Because Firebox Cloud is optimized to protect servers in an AWS virtual private cloud, some setup requirements, configuration options, and available features are different from other Firebox models. This section summarizes the differences between Firebox Cloud and other Fireboxes. You must use Fireware Web UI to administer your instance of Firebox Cloud. You can use WatchGuard Dimension to monitor the traffic and security status of the networks your Firebox protects. You cannot use a WatchGuard Management Server, Policy Manager, or Dimension to administer your instance of Firebox Cloud. For the Bring Your Own License option, you must activate a license key for Firebox Cloud on the WatchGuard website, and add the feature key to your instance of Firebox Cloud. For Firebox Cloud with a Pay As You Go license, the Threat Detection and Response service does not include Host Sensor licenses. Firebox Cloud supports two to eight interfaces. It supports one external interface (eth0), and up to seven private interfaces (eth1–eth7). All Firebox Cloud interfaces use DHCP to request an IP address. You assign an Elastic IP (EIP) address to the external interface. The internal IP addresses are assigned based on the private networks assigned to your AWS instance. Because AWS assigns the network interface IP addresses to the instance of Firebox Cloud, you cannot configure the network interfaces in Fireware Web UI. The Network > Interfaces configuration page is not visible in Fireware Web UI for Firebox Cloud. When you launch an instance of Firebox Cloud, it automatically starts with a default configuration. For Firebox Cloud with a BYOL license, you must get a feature key to enable configuration of all features. The Firebox Cloud Setup Wizard runs the first time you connect to Fireware Web UI. In the wizard you accept the End User License Agreement and choose new passphrases. Firebox Cloud supports most policy and security features available on other Firebox models. It supports a subset of networking features appropriate for the AWS environment. For supported features, the available configuration settings are the same as for any other Firebox. Most features and options that are not supported for Firebox Cloud do not appear in Fireware Web UI. In Fireware Web UI, it is possible to configure some features, such as IPv6 routes, that are not supported for Firebox Cloud. This does not enable the unsupported feature, and does no harm. For Firebox Cloud, some pages in Fireware Web UI includes information about the Firebox Cloud EC2 instance. The VM Information System Status page in Fireware Web UI includes more details about the Firebox Cloud EC2 instance. To go to the VM Information page, select System Status > VM Information. The Interfaces Dashboard page in Fireware Web UI includes information about the AWS virtual network interfaces associated with each Firebox Cloud interface. The subsequent use cases describe some of the ways Firebox Cloud can add security to your AWS virtual networks. To provide protection to one or more virtual servers that are accessible from the Internet, you can install a Firebox Cloud instance. Your instance of Firebox Cloud is then the gateway for inbound connections to your servers from the internet. You configure policies and security services on your instance of Firebox Cloud to control traffic to your virtual servers. You can configure your Firebox Cloud as a branch office VPN (BOVPN) gateway endpoint so you can maintain a secure VPN connection between your AWS network resources and other networks protected by a Firebox or compatible VPN gateway endpoint. Firebox Cloud supports all the same VPN features as other Firebox models. You can also enable Firebox Cloud to accept VPN connections from SSL, IPSec, and L2TP mobile VPN clients, and configure policies to control user and group access to your protected AWS network resources.